Our exciting range of Infrared (IR) and Optical touch frames converts any LED, LCD or rear projection screen into an interactive touch screen display. They are cost-effective, easy to assemble, quick to install and available in a range of sizes. Seamless integration with the information-driven YourWindow display makes the IR frame a popular choice for shop fronts, classrooms, museums, galleries, tourist information services and training rooms. A printed circuit controller board is hidden behind the transparent bezel of the touch frame display. An infrared light source is ‘interrupted’ when a user touches the screen. A series of phototransistors detect that the light has been “blocked” and a signal identifying the x and y coordinates is transmitted to the computer. The touch frame includes Windows software that is compatible with almost any media type. USB cable and installation fixtures (permanent and removable) are also included. The difference between the IR and Optical Touch frames is that the latter ‘sees’ the touching object (such as a finger or a pen) before contact is actually made. With optical sensors located at two corners of the screen, Optical Touch sees the touching object from two angles. The two sensors track the movement of any object close to the surface by detecting the interruption of an infrared light source. The sensors transmit signals to a printed circuit controller board that the light has been “blocked”. Specialist software acknowledges optical distortions and triangulates the position of the touching object with a high degree of accuracy. The technology also has the ability to reduce the effect of ambient light which creates a crystal clear resolution screen. 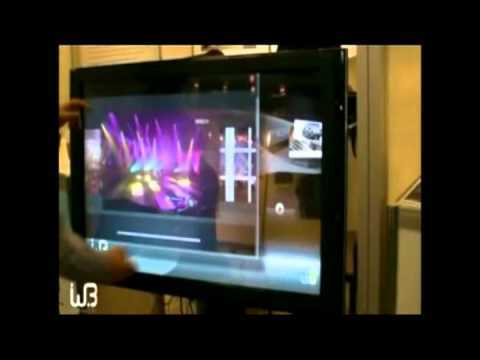 Check out our other YourWindow, Interactive Touch Table and Touch Foil interactive technology.